Insurance of Benin are on the cusp of sealing promotion to the top tier for the first time in eleven years after securing a second consecutive victory on Match-day 2 at the ongoing Nigeria National League (NNL) Super Eight at the Enyimba International Stadium, Aba where all four matches only came alive in the second half. Seven goals from the four matches played were a significant reduction from the goal fest that was Match-day 1 but Abubakar Danlami’s red card for Kogi United ensured a player was sent off for the second consecutive Match-day. The common thread of goalless first halves was first spun right from the day’s first match between Real Stars and Gombe United who both were searching for a first victory at the tournament after posting draws in their opening matches. Gombe had played a one all draw against Kogi United while Real Stars suffered heartbreak after they conceded an equaliser in the second minute of added time in their two all draw against Kada City. A second consecutive draw loomed large for both teams as the game entered its final moments but Real Stars somehow contrived to concede yet another goal in the second minute of added time for the second straight game when Adamu Mohammed was left unmarked to head in the winner at the near post for Gombe. The Desert Scorpions get their first win and move on to four points while Real Stars with a solitary point will curse the lack of concentration that has left them with a mountain to climb. Kogi United and Kada City took to the field in the second match and in keeping with the day’s theme; both teams went in level at the break. The match only came to life in the second half when Kogi scored two quick-fire goals in two minutes to stun their opponents. Nura Mohammed put Kogi ahead in the 50th minute and Kada City had barely gotten their wind back when Umar Mohammed struck the second a couple of minutes later. Kabiru Sanusi scored his second goal of the tournament and his team’s third from the spot in the 64th minute to complete the rout for Kogi United who also had Abubakar Danlami sent off for a second bookable offence. Kogi United now have four points from two games while Kada City yet to win a game have one point from two matches. 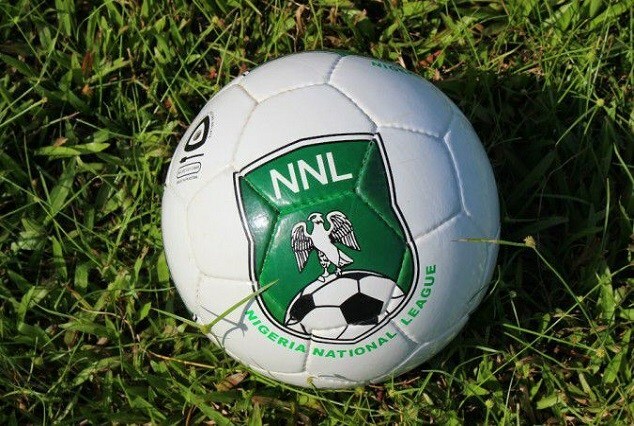 Delta Force are all but eliminated from promotion contention after they lost two nil to Shooting Stars Sports Club who bounced back from the three-nil shellacking they received at the hands of Remo Stars to give their hopes of a return to the Nigeria Professional Football League a big boost. With both teams looking for a maiden goal at the tournament, Delta Force who had also lost their first match against Insurance of Benin would feel the referee erred in waving away what appeared to be a strong claim for a penalty in the first half. They were the better team for the most parts and although a goalline clearance by Taye Muritala in the 55th minute prevented them from taking the lead, they found themselves a goal down just a minute later after Junior Ayobami’s effort rattled in off the post to put Shooting Stars in front. Shooting Stars wasted several other opportunities to extend their lead with Ayobami and Jonah Emmanuel particularly guilty of glaring misses, but the effervescent Opeoluwa Oluwafemi capped a hugely impressive performance with a goal to hand Shooting Stars a nil victory. Insurance of Benin are on the verge of securing a return to the top flight for the first time in over a decade after a Junior Osagie goal in the 69th minute secured maximum points for the Benin Arsenal over Remo Stars in the final game of Matchday 2. Insurance who are the only team to have won all their matches at the Super Eight now require just a draw from their final group match on Wednesday, January 9 to seal a much-coveted place in the top flight for the 2018/20019 season. Remo Stars on three points, must defeat Kada City in their final group game and hope that Insurance do not lose to Shooting Stars to secure a return to the top flight. After two days of action, teams will now rest and recuperate on Tuesday before the final round of group matches on Wednesday, January 9.